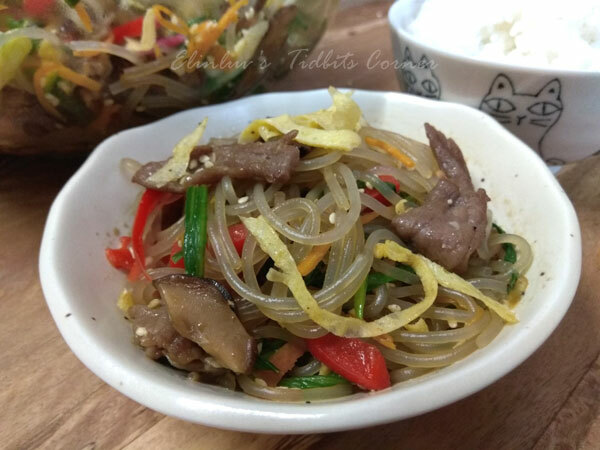 Japchae is a very popular Korean dish and it is the most sought after dish during the Korean festive holidays ( New Year's Day and Harvest Day ) It is also enjoyed on any other common day as well. As for me, I do make this whenever I feels the craving for it. 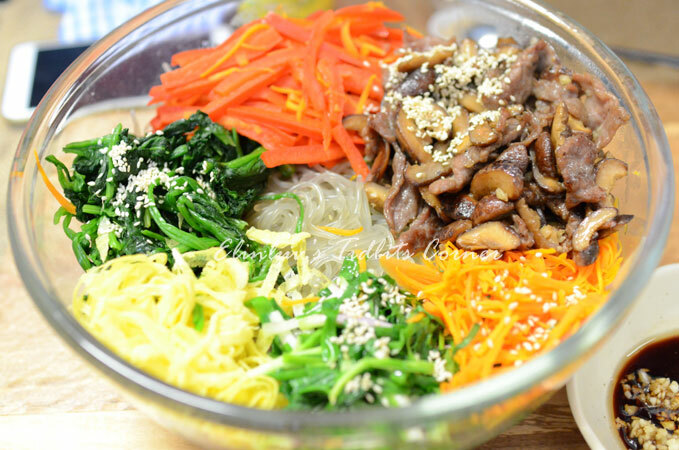 It can be served as a side dish or served on a bed of rice known as Japchae bap or as a main dish. The vegetables and meat are individually prepared, to some this might be cumbersome, I assure you it is ,but by preparing and cooking it individually , you can enhance their dividual flavors , texture and color better as each has their own cooking point. It is worth all the hardwork it entails. I discovered recently that the secret in creating the authentic flavor of this dish is to find the right balance between the soy sauce and sugar. I normally prepares a big portion as it can keep in the fridge for a day or two. 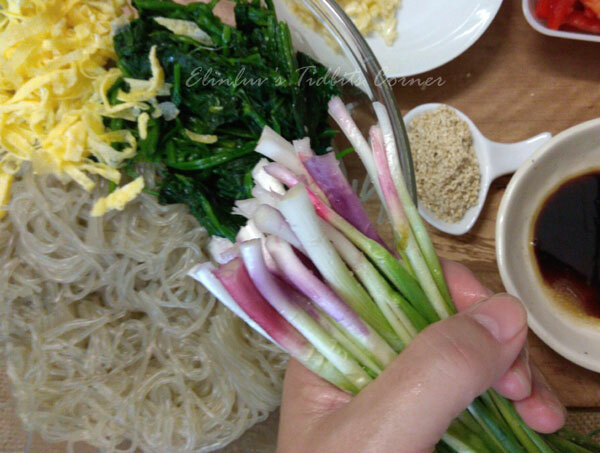 Hubby and I enjoyed this dish and having homegrown spring onions makes it even more special. It adds natural sweetness and fragrance to the dish. to find the right balance between the soy sauce and sugar. 1. Crack the egg and separate the egg yolk from the egg white. Remove the white stringy stuff (chalaza) from the yolk. Beat in a pinch of salt with a fork. 2. Add 1 teaspoon of vegetable oil to a heated nonstick pan. Swirl the oil around so it covers the pan, and then wipe off the excess heated oil with a kitchen towel so only a thin layer remains on the pan. 3. To keep the jidan as yellow as possible, turn off the heat and pour the egg yolk mixture into the pan. Tilt it around so the mixture spreads thinly. Let it cook using the remaining heat in the pan for about 1 minute. Flip it over and let it sit on the pan for 1 more minute. 1. Bring a large pot of water to a boil. Add the spinach and blanch for 30 seconds to 1 minute, then take it out with a slotted spoon or strainer. Let the water keep boiling to cook the noodles. 2. Rinse the spinach in cold water to stop it from cooking. Squeeze it with your hands to remove any excess water. Cut it a few times and put it into a bowl. Mix with 1 teaspoon soy sauce and 1 teaspoon sesame oil. Put it into a large mixing bowl. 3. Put the noodles into the boiling water, cover and cook for 1 minute. Stir them with a wooden spoon so they don’t stick together. Cover and keep cooking for another 7 minutes until the noodles are soft and chewy. 4. Strain and cut them a few times with kitchen scissors. Put the noodles into the large bowl next to the spinach. Add 2 teaspoons sesame oil, 1 teaspoon soy sauce, and 1 teaspoon sugar. Mix well by hand or a wooden spoon. This process will season the noodles and also keep the noodles from sticking to each other. 5. Heat up a skillet over medium high heat. Add 2 teaspoons vegetable oil with the onion, the green onion, and a pinch of salt. Stir-fry about 2 minutes until the onion looks a little translucent. Transfer to the noodle bowl. 6. Heat up the skillet again and add 2 teaspoons vegetable oil. Add the white mushrooms and a pinch of salt. Stir-fry for 2 minutes until softened and a little juicy. Transfer to the noodle bowl. 7. Heat up the skillet and add 1 teaspoon vegetable oil. Add the carrot and stir-fry for 20 seconds. Add the red bell pepper strips and stir-fry another 20 seconds. Transfer to the noodle bowl. 8. Heat up the skillet and add 2 teaspoons vegetable oil. Add the beef and mushroom mixture and stir fry for a few minutes until the beef is no longer pink and the mushrooms are softened and shiny. Transfer to the noodle bowl. Add 1 minced garlic clove, 1 tablespoon soy sauce, 1 tablespoon sugar, ½ teaspoon ground black pepper, and 2 teaspoons of sesame oil to the mixing bowl full of ingredients. Mix all together by hand. Add the egg garnish and 1 tablespoon sesame seeds. Mix it and transfer it to a large plate and serve. 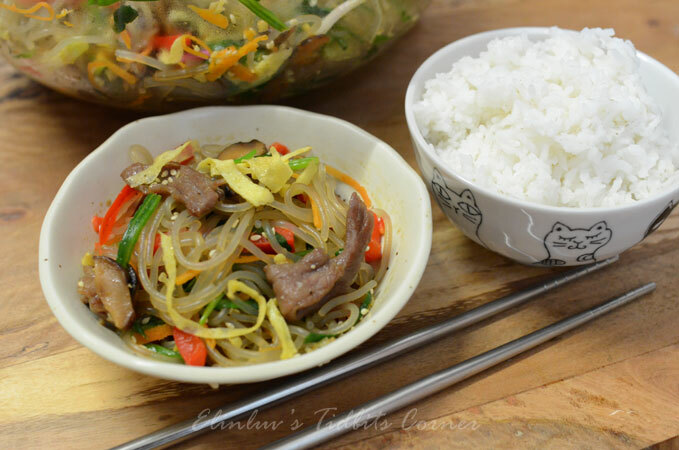 The best way to save time in preparing and cooking for Japchae is to familiarise yourself with the instructions above and multi-task (e.g. boil two pots of water for spinach and glass noodles at the same time). 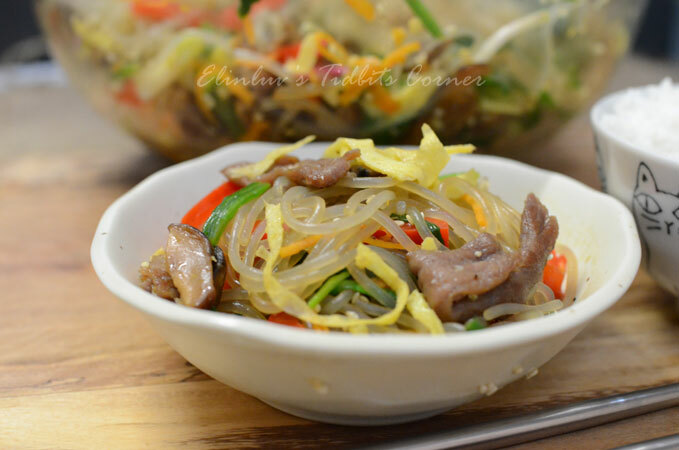 Japchae can be served hot or cold. You can also microwave it to reheat when necessary. 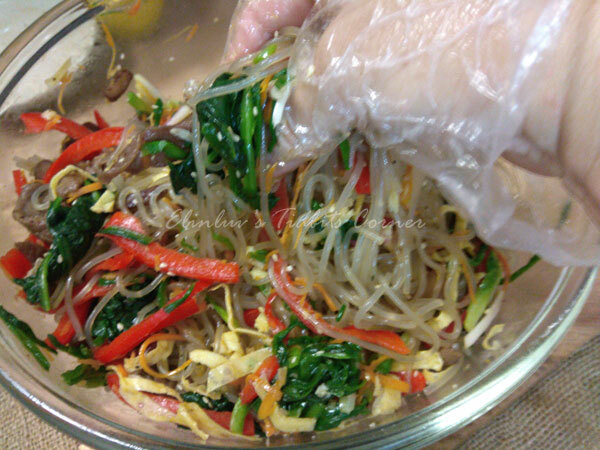 Japchae can be stored in the fridge for 1-2 days in an air tight container. It can be stored for a bit longer but the noodles don’t look as good by then. The dish looks delicious but too much work for lazy me! Lol!